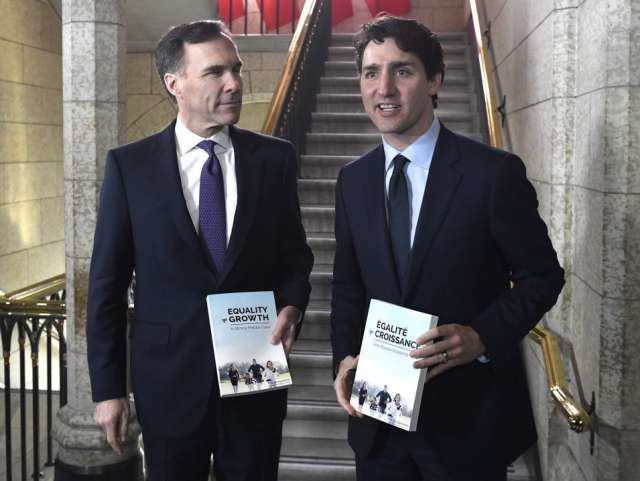 No one was surprised last week when Finance Minister Bill Morneau’s fall economic update shattered Liberal promises to balance the budget in 2019. But there was something new and surprising. Up until now, Finance Canada’s official projection was that deficits would continue until 2045, at which point another $450 billion will have been added to the national debt. That was bad enough. But that commitment was nowhere to be found in the fall economic statement and Trudeau refused to answer many questions about when the deficit would be eliminated. Ironically, with a little discipline, the Prime Minister could easily have kept his election promise to eliminate the deficit by next year. After all, he inherited great fortune: A balanced budget from the previous government, soaring real estate markets, booming U.S. and world economies, and record-low interest rates. These factors generated a $20-billion windfall of additional revenue last year. Trudeau blew every penny — and had to borrow $19 billion more just to keep the lights on. First, it makes us vulnerable for the next economic crisis. If our deficit is this large when all the luck is in our favour, what happens when the luck runs out? Central banks are raising rates because we’re near the peak of the economic cycle and Canadian oil prices are at crisis levels. The next economic downturn could be right around the corner. Trudeau’s new promise is to lower the debt-to-GDP ratio. How would that work in the event of another global recession? The economy would be shrinking, which reduces government revenues and increases spending on Employment Insurance for the jobless. To reduce the debt-to-GDP ratio under those circumstances would require the Liberals to massively cut spending and increase taxes to eliminate the deficit instantaneously and pay down debt faster than the economy shrinks.